So this is the second post in my series of foundation posts and it is of the Urban Decay All Nighter foundation today, which is a full coverage foundation. 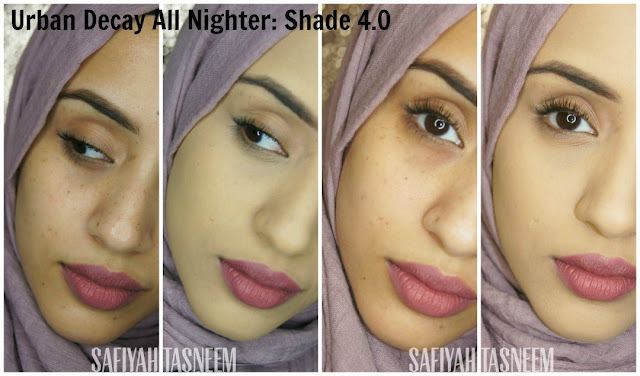 I did briefly try out these foundations on my Snapchat (safiyahtasneem), with live swatches so if you're not following me there, I suggest you do for further mini reviews and swatches. 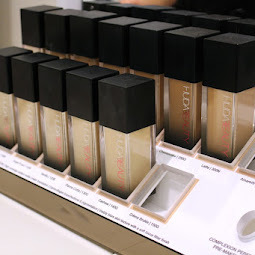 Before I start, I'm going to recap of the Urban Decay Naked Skin foundation which I reviewed back in 2012 here. My thoughts are somewhat still the same on the Naked skin foundation but in all honesty I don't wear foundation on a daily basis as I don't feel like I need to but if I did, Naked Skin would probably be my choice more so than this All Nighter foundation or any other similar lightweight foundation. I have however found since experimenting a bit more with different shades of UD Naked Skin, that the .0 shades aren't as yellow as I'd have liked them to be and shade 7.0 is slightly dark for me. 5.0 seems quite pink and 6.0 slightly yellower in Naked Skin and I found that in the sample of All Nighter, the 5.0 seemed pinker than the other two I was sent (4.0 and 6.0). 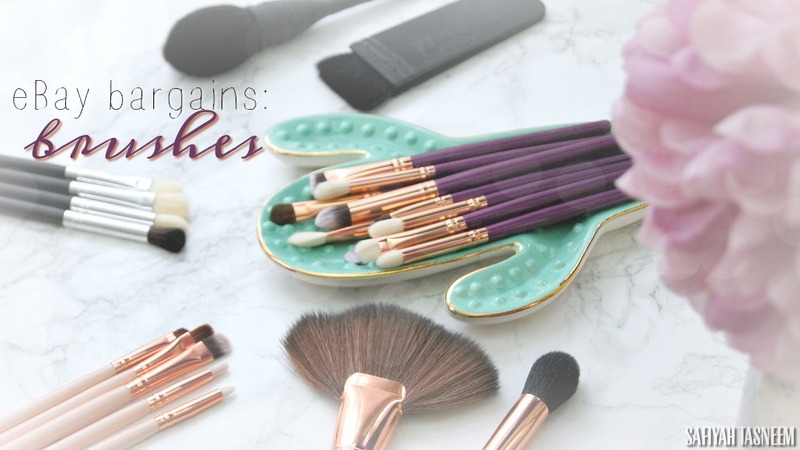 In this post I'll be showing the shades 4.0 (as it seemed the yellowest) and 6.0 for a possible colour match for warmer South Asian complexions. 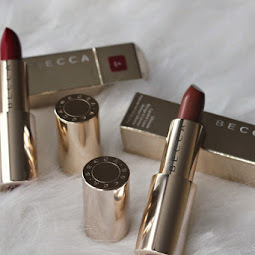 Packaging: The packaging is definitely "edgy"; I do like the gunmetal colour and the fact you can see the foundation shade clearly through the "shards" as opposed to prettier frosted packaging. The shiny gunmetal is however more difficult to photograph as it's more prone to fingerprints! As for the pump, it will always be a plus for makeup artists and consumers alike as it is easier, more hygienic and economical. 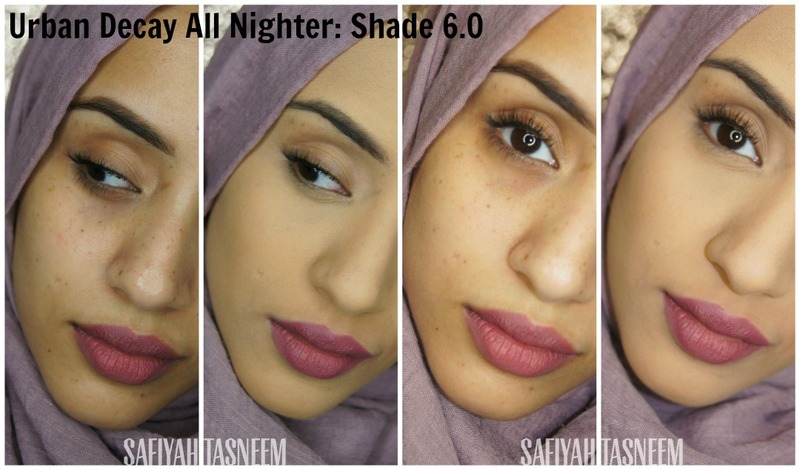 Unfortunately I couldn't find a shade range guide on the internet as I could with the Naked Skin; the only tool I could find is the Complexion Shade Calibrator but it suggests the Naked Skin and All Nighter shades are the same when I've found they are not; the All Nighters translate lighter than the Naked Skin foundations, so I'd recommend going a shade or two higher if you know your Naked Skin shade. These foundations do oxidise quite a lot but once it's dried down, I didn't find that it oxidised any further, so I would highly recommend you visit a store rather than ordering online. There's no particular "medium/golden/warm" type descriptions available so I will be sharing my personal views here! "4.0": The yellowest of all three shades above, I'd say for NC20-25. "5.0": I found it to be pinker than the other two shades, so I'd say it's suitable for NW25ish complexions. 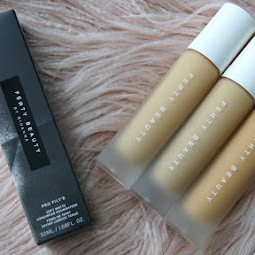 "6.0": This was the darkest of the shades sent to me, and I found it was still a tad too light (and pink) for my current semi-tanned complexion, so I'd say it would be good for NW/NC25-30ish complexions. Coverage: This foundation has is definitely full coverage for me especially. 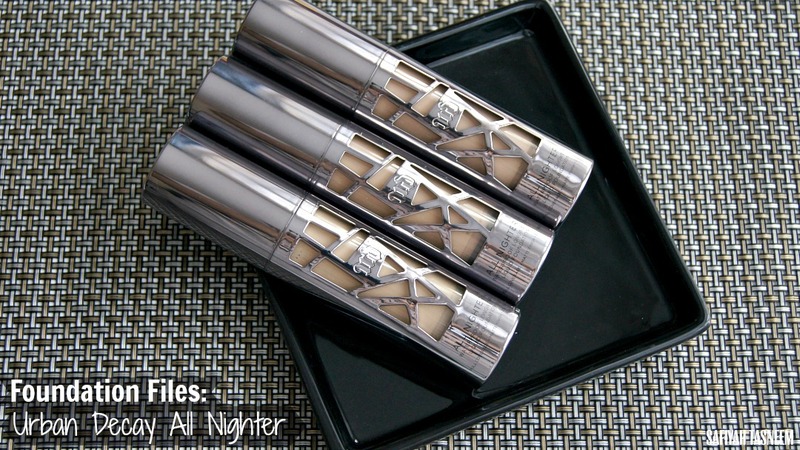 If you're a fan of Estee Lauder Double Wear foundation, I would say this is on par with it. Finish: After it has been blended into the skin and allowed to settle, it has a matte finish. I applied these with my beauty blender which made it feel more comfortable to wear initially, but as I have combination skin, I did feel slightly dry after about an hour or so so felt the need to spritz my face with fix+. Because of this dry feeling sensation, I felt like I had something on my skin, however if you're used to wearing foundation or have oily skin, this should feel pretty comfortable to wear. Texture: It's a thicker texture than other foundations (not as liquid/runny) but does buffs/blend seamlessly and gives even skintone and texture; definitely hid my freckles and beauty spots. Longevity: As the name suggests, this is a long wearing foundation, and because it is matte I believe this could be great for oilier skin types. 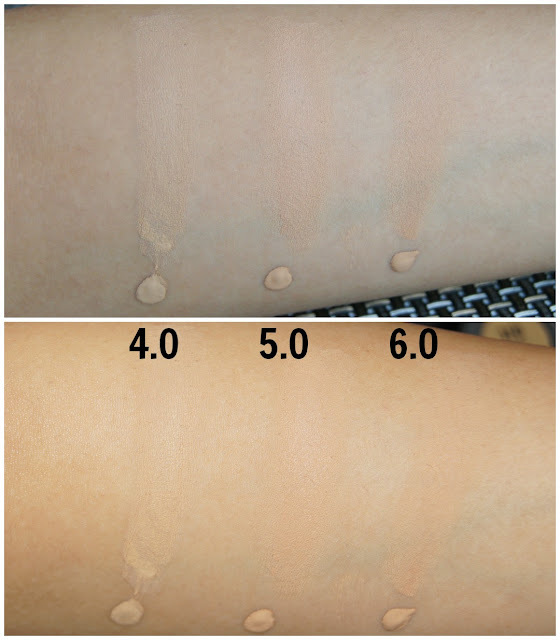 Urban Decay claims the foundation is waterproof and I was sceptical at first but when I tried to take off the swatches from my hand (once they had dried), I was shocked that they wouldn't budge. It actually was hard to take off with even a wipe that usually takes off the most stubborn of swatches, so I had to use an oily make up remover to take it off (just as I have to with other waterproof products). Price: At £27 it's quite pricey but cheaper than it's Estee Lauder competitor (£31). If you are someone who loves/needs super high coverage foundation, this is definitely one to try (once matched in store!). Overall rating: I'd have to say unfortunately these foundations aren't for me unless I am having a mass breakout or have oily skin or want to look supremely flawless! 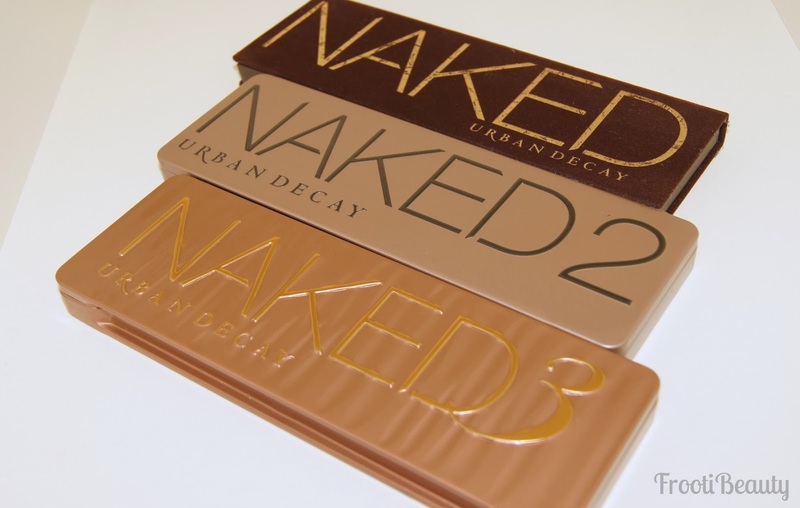 The shade range is really hard to work out compared to the Naked Skin, so I'd have to go in store and check it out which is near impossible for me with a toddler right now! However, for those with oilier skin types who are extra conscious of imperfections, I do feel like this foundation would be at least a 4.5. So I'll give it a point for coverage, point for waterproofness, and a point for the longevity. Have you tried this foundation? Which full coverage foundations are your favourite?